Coach's Corner - Andy Warhol hand painted/signed & certified original artwork. Go Back to Lot List Andy Warhol hand painted/signed & certified original artwork. 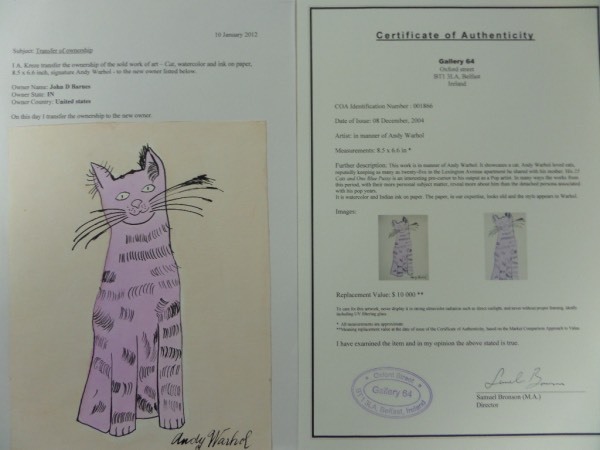 This super high value, all original Warhol work is titled "Purple Cat" and shows one of the late pop artists 1960's works. It is a colorful 7x9 piece, has several LOA's included, including the National Fine Arts, and a provenance LOA from Director Samuel Bronson of the Gallery 64 in Belfast Ireland. It is valued at $10,000, is a watercolor and indian ink on paper, and begs to be matted, framed and shown off proudly.